David Banisar is a Research Fellow at the Harvard Information Infrastructure Project at the Kennedy School of Government at Harvard University and is also Deputy Director of Privacy International, an international human rights group based in London, UK. He also does consulting for various NGOs such as Consumers International, the Center for Media Education, and the Transactional Records Access Clearinghouse. Mr. Banisar works on freedom of information and privacy related issues including international developments, encryption, wiretapping, and new surveillance technologies. He was one of the founders of EPIC and was a Staff Counsel and Policy Director from 1994 until April 1999. 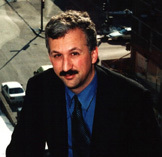 Previously, David Banisar worked for USACM, the ACM US Public Policy Office, Computer Professional for Socal Responsibility as a policy analyst and the Prince George's County, MD Public Defenders' Office as a law clerk.